Easily manage your entire conference from one account. Maintain team schedules, scores, rosters and stats with the click of a button. SIDtools Conference Solution provides flexibility for the individual needs of a conference, including customizable conference awards, user and score reports, user management and the ability to maintain your conference history. • Automatic syncing from SIDtools to the conference site. • Link to social media sites like Facebook and Twitter. • Manage articles and photos. 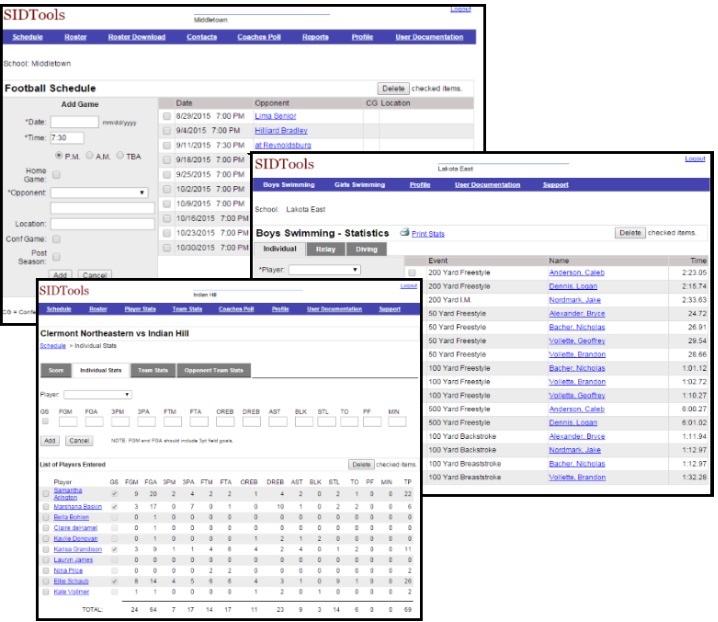 Easily manage your team’s schedule, scores, stats and roster with direct entry into the SIDtools site. SIDtools allows users to view and print individual and team reports. SIDtools is compatible with CyberSports, DakStats, Digital Scout and Stat Crew software platforms. Stats can be imported directly from the software into SIDtools. • Simple score and stat entry. • Reports provide individual and team analysis. SIDtools is a very organized and professional company that shows a level of professionalism that sets the standard for high school sports websites. The website tools are very user friendly and allows me to make changes in very short amount of time. Their customer representatives respond very quickly and go beyond to help. I cannot say enough about them. It has been 11 years that I have been using the SIDtools interface for Cincinnati St. Xavier High School. It has worked well and makes my job so much easier reporting the stats for sporting events. The connection to the Cincinnati Enquirer makes the information stream simple and quick. Thanks for your hard work and professionalism. As Sports Information Director for both the Eastern Cincinnati Conference and the Miami Valley Conference, SIDtools created by Sports Websoft has made collecting, organizing and recording team stats easy and enjoyable. The biggest advantage for coaches utilizing the SIDtools program is that the statistics entered into the SIDtools site are immediately linked to our conference websites and to the Cincinnati Enquirer's online media sports pages. You will be amazed at the amount of information which can be found on the sites - all aimed at publicizing student athletes! I have been involved with SIDtools for 10 years. As an SID, it makes my job much easier in the way that our site is set up. The coaches like the way it makes it easy for them to record stats, and being a coach for a team in our league, I can attest to that myself. Customer service is outstanding. If a coach or myself has a question , it is answered very quickly. I also am involved with high school football & basketball broadcasts. 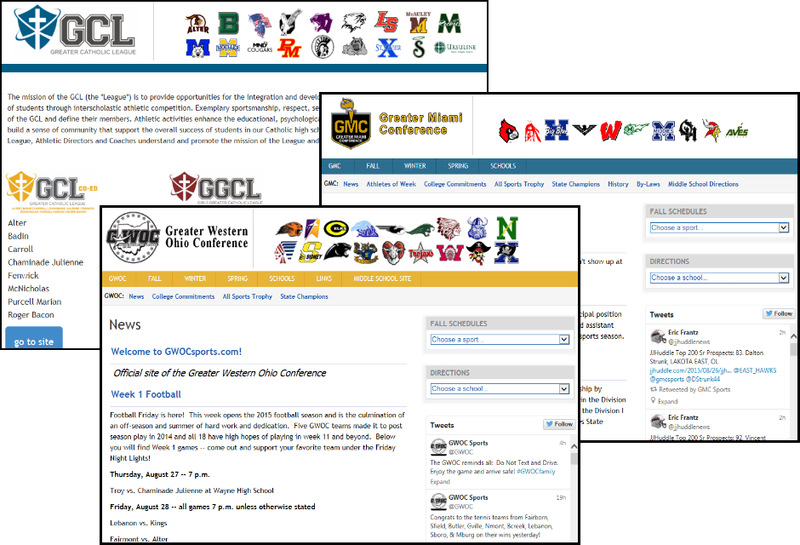 Now that almost every league in southwestern Ohio is part of SIDtools, it makes it much simpler to get information on teams. After seeing other league set-ups that are not SIDtools, it makes me appreciate them even more.